Leonard Schroeter was a major force in the plaintiff’s bar for over 40 years. While he attended Harvard Law School, he taught constitutional history for two years at Northeastern University and directed its Center for International Relations. When the civil rights movement emerged in 1963-1964, he became active in the National Association for the Advancement of Colored People (NAACP) Lawyers Constitutional Defense Committee (LCDC). The late Justice Thurgood Marshall headed LCDC, a loose federation of groups which represented blacks arrested in civil rights demonstrations in Southern states. With this group Schroeter traveled to Mississippi and other Southern states in 1965. After relocating to Washington State in 1953, Schroeter served as deputy prosecuting attorney for King County. At the request of then Seattle mayor Allan Pomeroy, Schroeter was appointed to the Mayor’s Advisory Committee on Police Practices in 1955 to investigate a large number of instances of alleged police brutality. He became a board member of the ACLU of Washington in 1953 and in 1964 became the first national board member from the Pacific Northwest. He then started a trial practice (Schroeter Goldmark Bender) at a firm that still bears his name. In 1997, he left SGB with Paul Whelan, Mike Withey and Kevin Coluccio to form a firm with Paul Stritmatter and Keith Kessler, now Stritmatter Kessler, where he continued his commitment to public interest and constitutional law. He was also active in international law/legal affairs, serving as Principal Legal Assistant to the Attorney General of Israel. 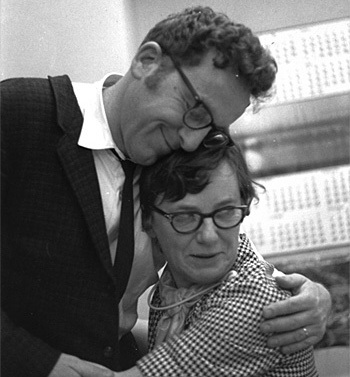 From 1970 to mid-1972 Schroeter’s major assignment as principal legal assistant to Israel’s attorney general was to mobilize world opinion to the human rights of Jews who were prohibited from leaving the Soviet Union. For more than a decade, he represented Samizdat (underground) writers and human rights advocates in the former Soviet Union. Making clandestine visits, Schroeter met with dissident Soviet writers, including Andre Sakharov, and with Jews striving to leave the USSR. This visit accelerated his involvement in their causes. After returning to the U.S. in September 1972 he tried, but failed, to interest the Nixon administration in these human rights causes. Schroeter then turned to his senator, Henry M. Jackson of Washington State, who adopted them. The Trade Act of 1974, commonly known as the Jackson-Vanik amendment, was the result. This law made non-market economy countries that denied their citizens the right to emigrate ineligible for normal trade relations with the U.S. After 1994, Schroeter’s focused his efforts on issues of access to justice and protecting Constitutional rights, eventually founding the Schroeter Constitutional Center. Leonard is survived by his wife, Alice, and his children, Josh, Daniel, Benjamin, David Michael, Caitlin and Sara. Leonard Schroeter with paralegal, Alice Ballmer. Read an article about Schroeter’s roots with Stritmatter Kessler Whelan. The Wiedemann & Wysocki Award recognizes AAJ members who have made outstanding efforts to support AAJ PAC and advance AAJ’s political priorities.